Reitmeier is thrilled to announce the launch of our innovative continuing education program, Reitmeier University! As you may know, Reitmeier is committed to Leading the Way in everything we do – which is a commitment that extends to optimizing our employee training efforts, developing the skilled trades, and becoming a leader in our industry. To that end, we have been working hard to create a curriculum that would empower our employees and create new opportunities for the emerging workforce. And after much anticipation, we are excited to report that the program has been officially launched! Reitmeier University is a two-year certification program for new Reitmeier employees. Our comprehensive curriculum is designed to develop institutional knowledge and orient team members to the Reitmeier way and culture. 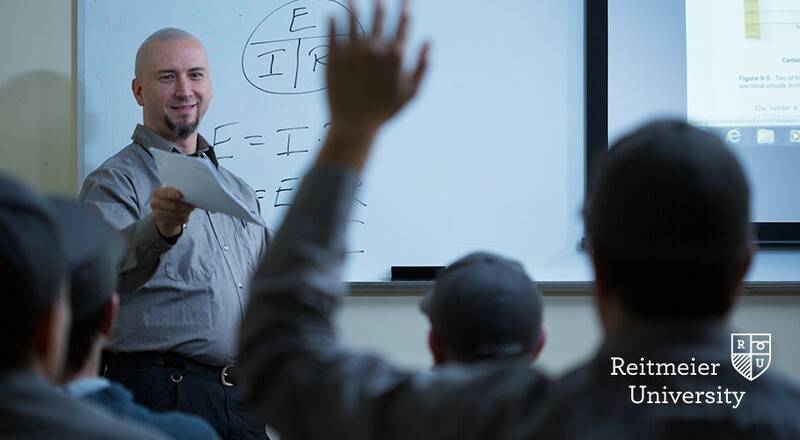 In addition to traditional classroom education, we also partner each new hire with an experienced Senior Level Technician who mentors them along the way – showing them the best ways to tackle real-world HVAC issues. The skilled trade job market is changing – and a talent shortage has negative consequences for our business, our industry, and our clients. Reitmeier recognized this trend, and made the decision to do something completely unprecedented for our field. Reitmeier’s dedication to America’s workforce has sparked a paradigm shift in the way skilled workers are educated and developed. As always, our clients can expect the same honest, reliable service that has made Reitmeier famous over the last 30 years – but now with an even more qualified talent base, and an ongoing commitment to bettering its people. For those interested, we are looking for opportunities to expand the program to include partners, vendors, and clients – to continue to share the wealth of industry knowledge in our community. Stay tuned for more information on how you can get involved. Thank you to all our partners and friends for your ongoing support in this effort! We look forward to continuing to lead the way in HVAC. Click here to learn more about Reitmeier University, or visit our Career Center for open positions.